Flowers at home lift the room and bring freshness from the outdoors in. They’re a real treat and I’m a firm believer that treats should be dragged out for as long as possible. 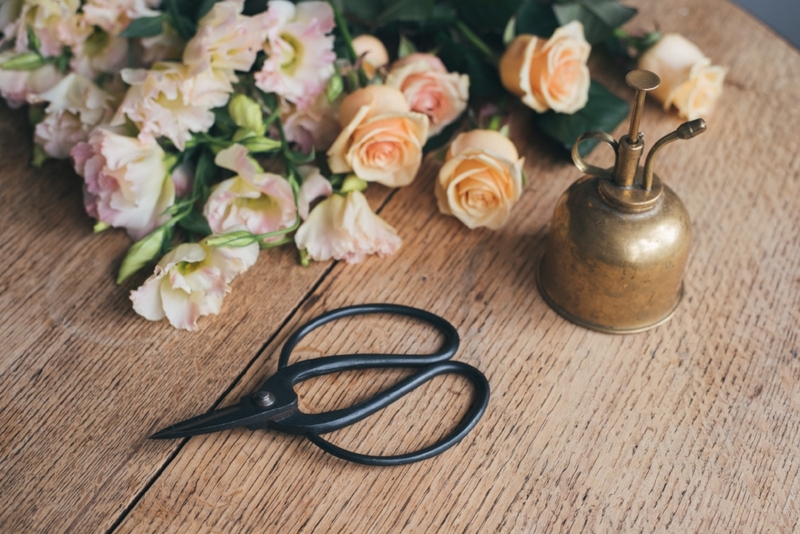 I’ve therefore written up 4 simple ways to prolong your cut flowers, to get the most from them and to make them last for as long as possible. So my 1st tip would be to make sure you clean the vases, the bowls or the jugs you use for flowers really thoroughly after you’ve finished with them and before you put flowers in them. You can use a drop of bleach and wear gloves and give everything a really good scrub. Rinse off with cold water because cold water gives everything a sparkly shine. Not sure why, but I find cold water does the trick! Or you can use washing up liquid and I’ve recently discovered that Method bathroom cleaner is also an amazing vase cleaning product and its good for the environment, is sometimes on offer at Waitrose and Robert Dyas which is always great news and it smells nice! So give your vases a good scrub to make sure there’s less dirt and bacteria as bacteria affects the life span of flowers. It’s also a good idea to keep your scissors clean from flower bits and bobs. My second tip would be to make sure the stems are really clean and clear of leaves, twigs, and places were dirt can get trapped. I have thorn strippers which get rid of the thorns and leaves from roses. You can also wear gloves to pull off the leaves and scissors to snip away any thorns or fly away pieces of stem. Make sure all the leaves are off below the tie point of your bouquet, so basically by that I mean make sure there are no leaves under the water because they make the water go mushy and brown and the flowers don’t like that. Then my 3rd tip is to change the water in your vase every other day. I know that sounds like a bit of a pain but it will make your flowers last longer and the clean water is much more attractive than murky swamp water. In between each water change make sure you give the vase a wipe round because you’ll notice a layer of brown scum on the vase and you don’t want that to sit in the water with the flowers, so just wipe that off with your method cleaner or fairy liquid. Rinse clean and then add fresh cold water. Before you put the stems back in, give them a little snip, a couple of cm is fine. This makes sure that the water has a really easy passage to travel up the stem into the leaves and flowers. You can also give the flowers a reshuffle each time you change the water, take out any stragglers that have seen better days. My 4th tip is to keep your flowers way from heat or direct sunlight. It’s quite hard to do this on a hot sunny day in summer and also in winter when you need the radiator on because it’s freezing outside. But I would say, keep your flowers away as far as possible from heat or sunlight because the warmth in the water will multiply the bacteria faster and create a weird algae. Common sense to me says that browny green water doesn’t make the flowers very happy. Is that daffodils leak out a substance into the water that kills other flowers including tulips. In spring time, when you get beautiful daffodils and tulips available in the shops, try to keep them separate because one murders the other. If you do want to combine them or you get a bouquet that seems to have them mixed up in it together you’re going to have to get the daffodils to seep out as much of their sap as you can. I would advise that you get your daffodil bunch, cut the stems, put them in water and just keep changing the water over the next couple of hours, whenever you get the chance. You want the white cloudy sap to disperse out from the stem as much as possible. Keep changing the water until less is coming out of the daffodils so when they’re put with the tulips they’re probably less likely to kill them. Clean and leaf free stems go below the water line. I’ve thought of a bonus bonus tip! If your cut hydrangeas or rose stems have drooped or shriveled, there is potential to bring them back to life. To do this, you need to boil the kettle, then once the water is just boiled, pour it into a cup or mug that won’t shatter with boiling water in it (not your favourite vase). Just an inch or so of hot water, not too deep. Then re-cut your flower stem at an angle, put the flower stems into the hot water and leave there for a minute. I learnt this at Flower College as shock treatment. Through my own experience I’ve realised it works best if you use cold water separately after the hot water. So next you need to fill a vase with cold water. After the minute is up, take the stems out of the hot water and cut above the line where the stem was in the water, because you’ll notice the stem’s been slightly cooked in the very hot water. Above that line you re-cut the stem and put the stem straight into the cold water. It’s likely that the cut flower will now be able to drink water again because there may have been an air bubble that the hot water has resolved. Give it a couple of hours and fingers crossed, the rose or hydrangea will have revived itself (disclaimer: always be careful around boiling hot water x). I can’t wait to hear if any of you have any tips or questions about keeping your flowers alive for longer, head to my contact page to let me know. You can also follow me on Instagram for more flower tips and blog posts like this one. Including free resources, flower insights and exciting news and updates.